There are several places in the world where you can dive beneath an oil rig, but only one place where you can dive from an oil rig. But don't worry about getting grease on your wetsuit, because this rig is different, and it happens to be sitting in one of the world's best diving destinations. 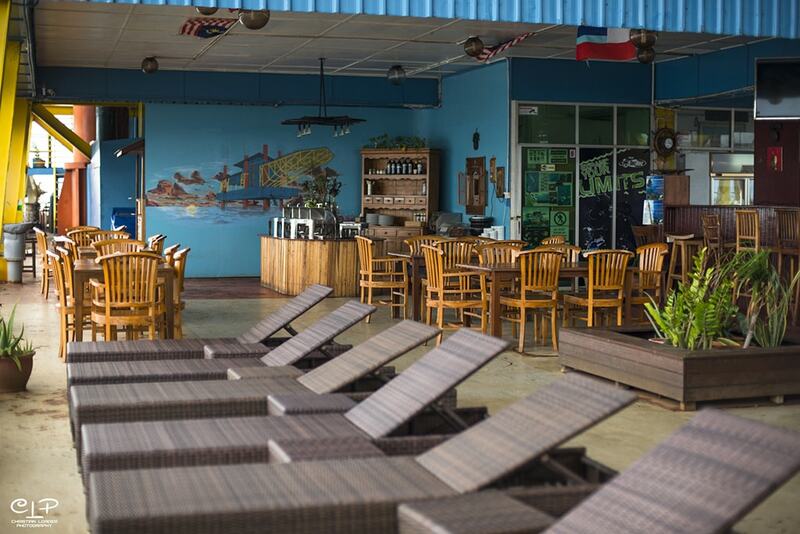 The place is the east coast of Malaysian Borneo, just a few miles from the famous dive sites of Sipadan Island, and the structure is known as the SeaVentures Dive Rig Resort. A view of the SeaVentures main deck, with lining and lounge areas in the background. 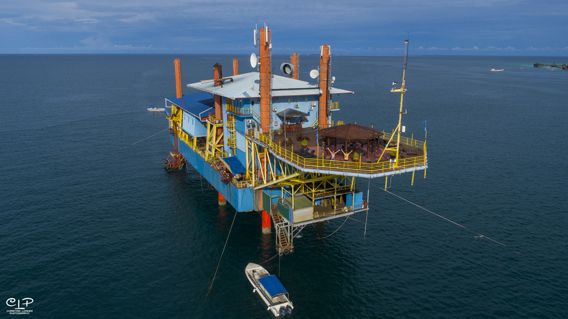 The story of how a platform built for the offshore oil industry was transformed into a dive resort begins in Panama, where this structure, known as a jack-up rig, was fabricated to serve as a mobile base of operations for drillers. Decommissioned in 1985, the rig was purchased for conversion into an on-water fishing lodge. A change of plans transformed the platform into a dive station, and in 1997 it was brought to the eastern coast of Borneo Malaysia. There, it was positioned in relatively shallow water just a short distance from the island of Mabul, which is the gateway to the region's diving activity. The lounge area of the SeaVenture offers sweeping ocean views. At first glance, a structure designed for oil exploration might not seem like a particularly eco-friendly option for a dive resort. But in reality, by simply placing the rig's six legs on the sea floor, the SeaVentures Rig was able to create a much smaller ecological footprint than land-based resorts where trees are often removed, and beaches and waterfronts are changed. In addition, the rig's pilings soon became a fish haven, and over the years, a number of additional underwater structures and artificial reefs have added new underwater habitat. A deluxe cabin on the rig provides all the comforts of a land-based hotel room. Guests arrive at the SeaVentures Rig by boat and ride an elevator to the elevated main deck. This expansive area includes dedicated gear storage spaces and rigging stations, fill station, camera room and public spaces such as an open-air dining room. Additional facilities include a games room, 60-person conference room and a sundeck lounge. Guest accommodations range from a four-person bunk room to cost-effective twin and double rooms with ensuite bathrooms, and deluxe rooms with sitting areas. These arrangements provide everything divers need when relaxing after a day of diving. The rig is known for its striking 360-degree water views of the Celebes Sea, and for serving some of the best meals of any resort in the area. 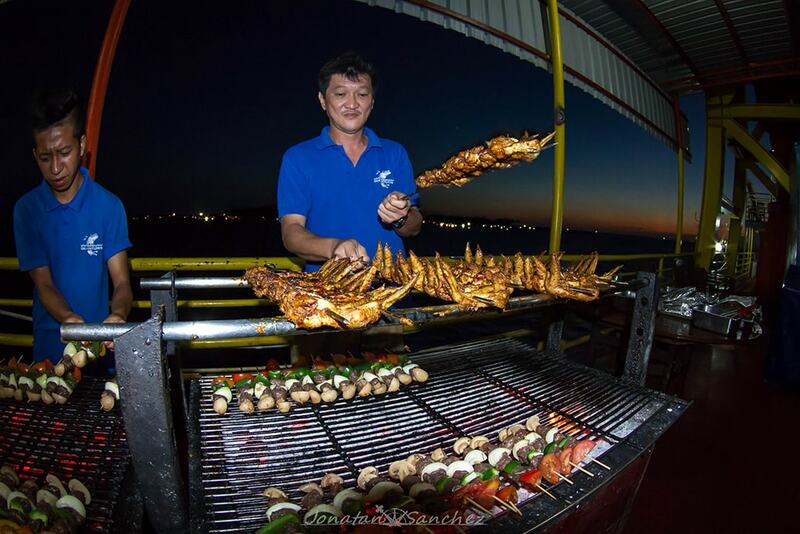 BBQ nights are a guest favorite on the SeaVenture. The SeaVentures House Reef is more than a coastal coral reef. 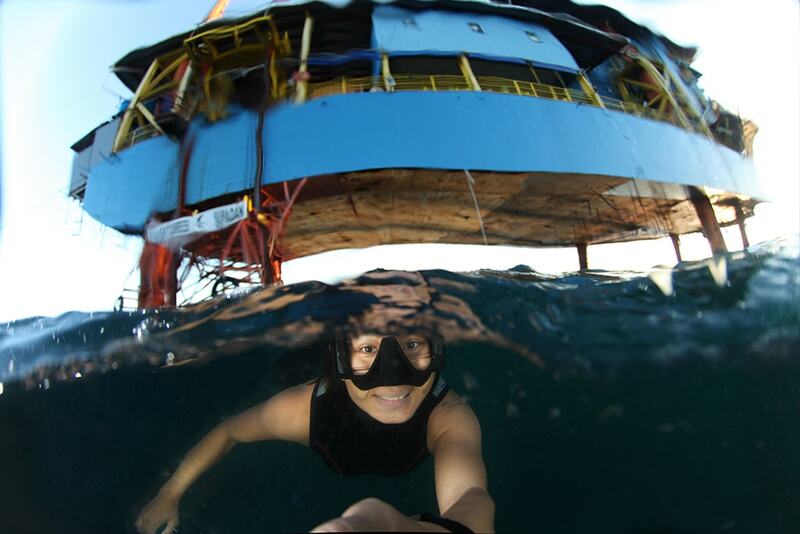 Over the years, the submerged landscape around the rig has become the site for an ever-growing collection of wrecks, swim-through cages, bridges and other man-made structures designed to attract fish and to provide shelter for a variety of marine life. This underwater playground is available to rig-based divers 24/7, and night dives are especially productive. Divers can explore below pilings of the SeaVenture to discover a landscape of artificial reefs and fish-attracting structures. This site also takes in a natural reef system that holds a treasure trove of both fish life and macro subjects. The sea fans that adorn the reef are a prime area to search for subjects such as crocodile fish, ornate ghost pipefish, frogfish and elusive pygmy seahorses. The rig's dive guides are experts at finding small treasures and will provide guide services during orientation dives to help guests identify the best hunting grounds. Sandy areas between coral heads are also good places to search for colorful finds such as nudibranchs, while the rig pilings attract schooling fish, and may be visited by large grouper. 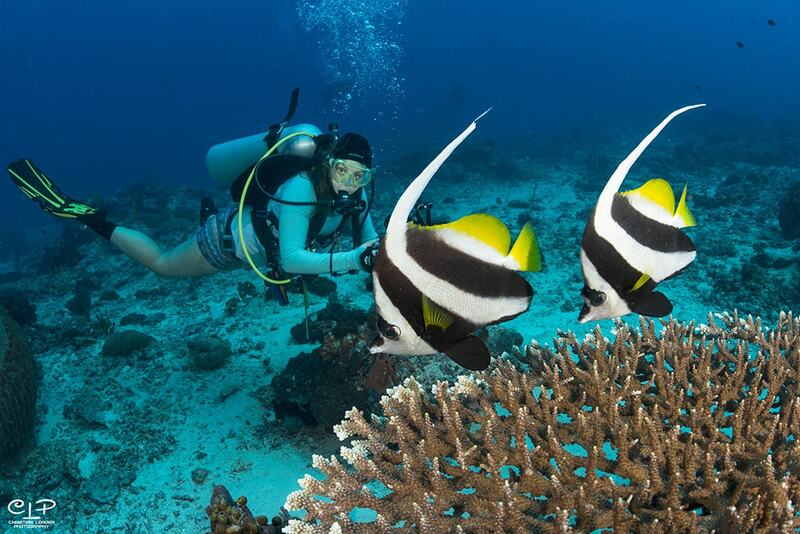 The SeaVentures house reef also takes in natural coral structures and macro-rich habitats. 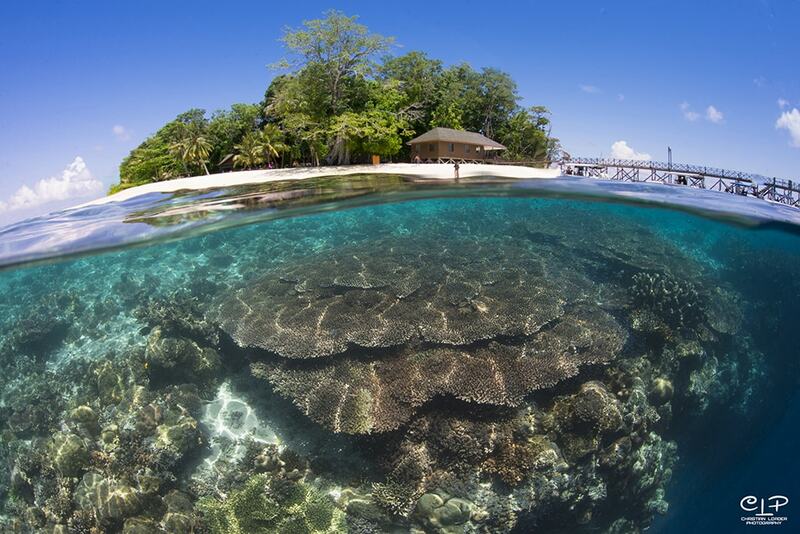 The underwater walls of Sipadan Island start shallow and close to shore. 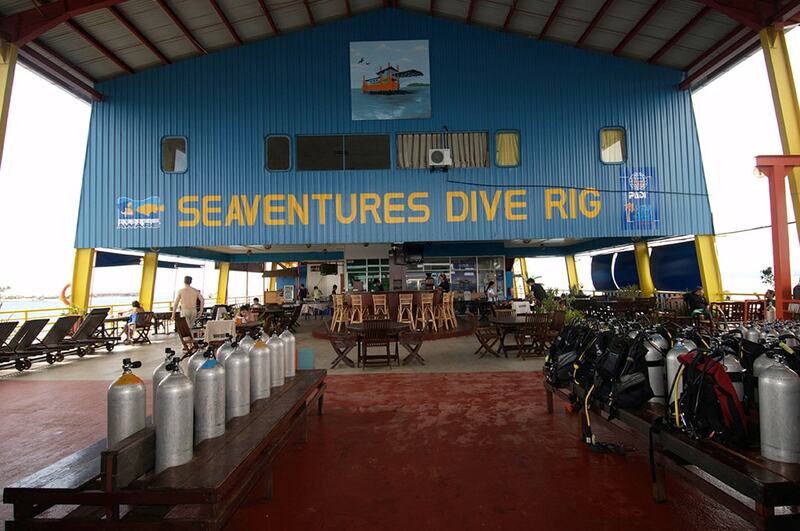 The location of the SeaVentures Rig was chosen for its proximity to many of Malaysia's top dive sites. The best-known of these is the marine preserve at Sipadan Island. SeaVentures boats make daily trips to the island, which is accessible only by permit. 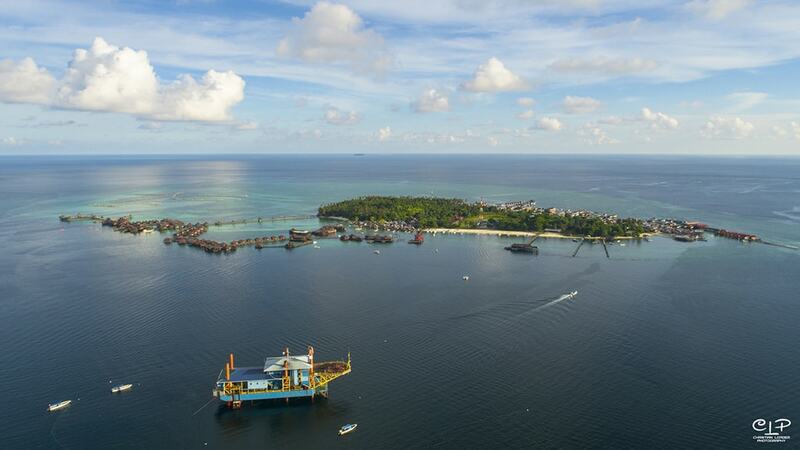 Divers staying four days or more on the rig are guaranteed at least one day of diving at Sipadan, and additional excursions can be added. The preserve is known for its precipitous walls, massive shoals of fish, healthy populations of white tip and gray reef sharks, and an abundance of green and hawksbill turtles. 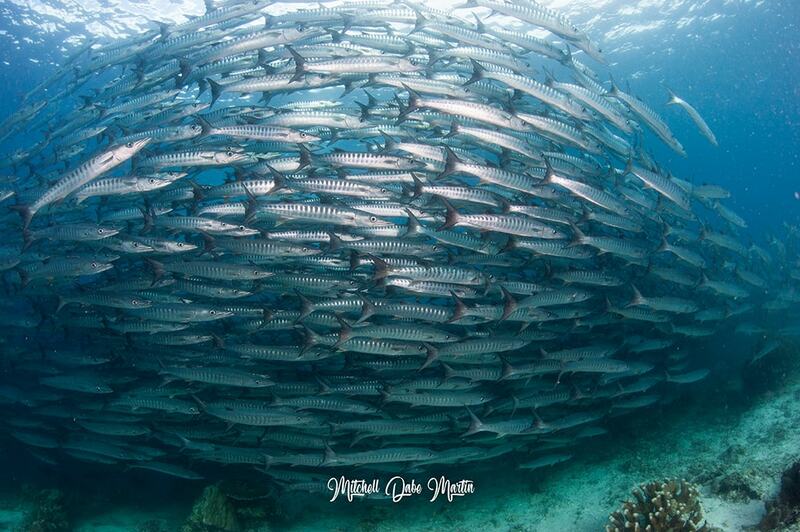 A massive school of barracuda gathers in the shallows of Sipadan Island. In addition to Sipadan, SeaVenture divers can make short boat rides to visit the nearby reefs surrounding Mabul, which are home to some of the best macro in the area. Here divers will find frogfish, pygmy seahorses, flamboyant cuttlefish, blue-ringed octopus, scorpion leaf fish, harlequin shrimps and more. Mabul trips may also be combined with visits to Kapalai, where a sand spit has been transformed into a macro hunter dream where the sea floor is covered in a collection of sunken boats, metal frames and structures created specifically to encourage coral growth. Another favorite excursion is the Sunset Mandarin Dive, which allows divers to witness the famed mating dances of these colorful little fish. 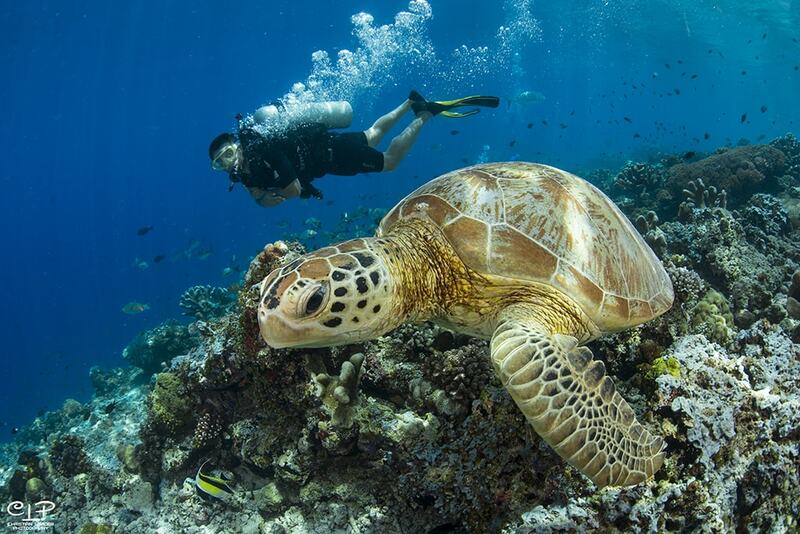 Sipadan is known for its year-round population of sea turtles. 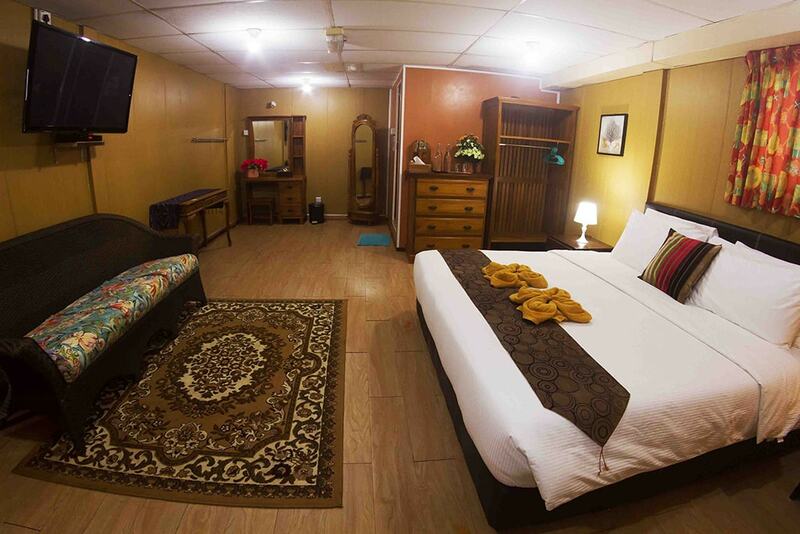 We represent the SeaVentures Dive Rig Resort and can create a customized vacation package that take in the best reefs and can also include land-based adventures into the nature preserves and mountain highlands of Malaysian Borneo. To learn more, give Caradonna's expert agents a call at 800-330-6611 or send a note to sales@caradonna.com. The SeaVentures rig sits close to the island of Mabul.